On Thursday, I attended the inaugural picture book seminar at The University of Waikato. The theme was "Diversity in Picturebooks". There were 15 speakers from public libraries, tertiary institutions, school libraries and the National Library, as well as a teacher, writers and an illustrator. It was a wonderful mix of approaches and content, a diverse line up to discuss diversity! 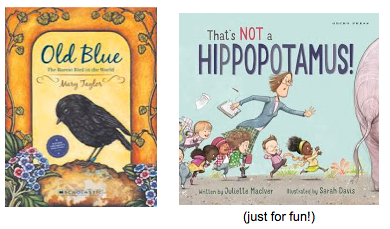 "Diversity in Picturebooks in Public Libraries"
Gameedah recommended the resources on diversity from the ALA's site. Plus "Last stop on Market Street" by Matt de la Pena, "Whoever you are" by Mem Fox and "My two blankets" by Irena Kobold, which are great and I already have in my library. 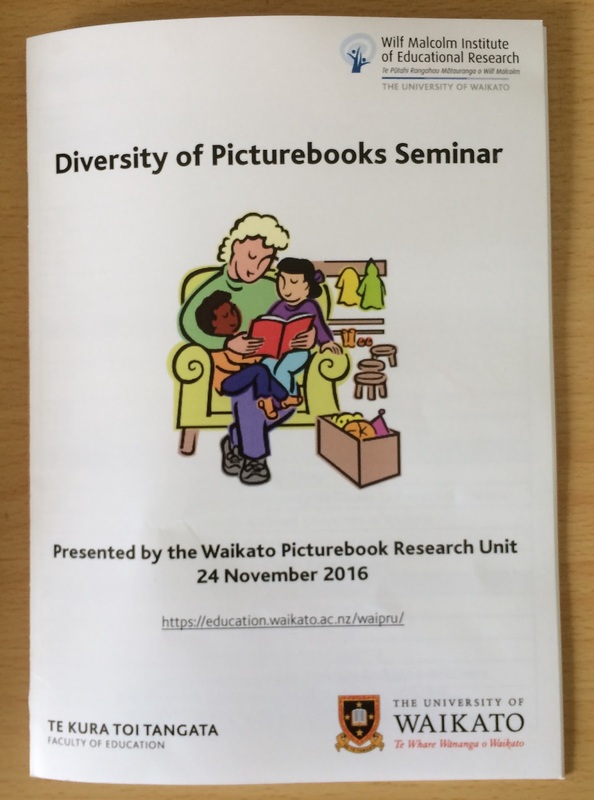 "Diversity in Picturebooks at the National Library's School Collection"
Mrs Tisdall, okay, Rosemary, talked about diversity in relation to religion, identity, family, occupations, culture, gender, LGBT, physical appearance and disability. Add to these "Mirror" by Jeannie Baker, "Azzi in Between" by Sarah Garland and "Fiapule" by Catherine Hannken, which we have at school and are awesome. And then lots more on top of that. As well as working for the National Library, she runs her own agency, as a children's literature and educational resource consultant, so no wonder she had plenty of books to recommend. "How Picturebooks Present Māori Knowledge and Values"
Joan looked at the way three picture books expressed Māori values and knowledge of the world. Unfortunately, "Haere: Farewell, Jack, Farewell" is now out of print. "Diversity in Beliefs, Culture and Refugees"
My lovely friend Gerri drew on the recent IBBY congress in Auckland to discuss picture books that highlight diversity. She was inspired by many of the poster presentations which featured picture books, and the conversations she had with the presenters. Gerri also mentioned "Old Hu-Hu" by Kyle Mewburn (teaching materials here) and "Badger's Parting Gifts" by Susan Varley as examples of books that deal with dying and grief. "The Price of Reversioning Picturebooks to Te Reo Māori"
Darryn's talk was a fascinating exploration of the idea that "cultural integrity is more important than cultural exploration". When books are published in English and then translated into Māori, attention needs to be paid as to whether the books selected are culturally appropriate. 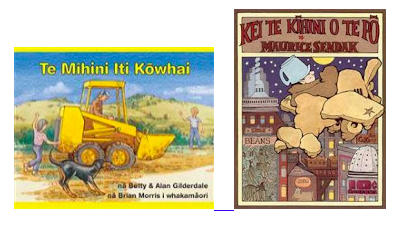 Darryn spoke about the lack of agency for the Māori character in the book "The Little Yellow Digger", which he did not really notice until the book was translated into Māori. He also described why "In the Night Kitchen" breaks tapu. I would love to hear Darryn speak again, hopefully he will return next year. "You Have to Start with Something"
She also mentioned "Morris Micklewhite and the Tangerine Dress by Christine Baldacchino. "Navigation to Safety: Using a Human Rights Lens to Develop Empathy and Validate Refugee Children's Experiences"
Trish recommended this website address - mirrorswindowsdoors.org/wp/themes/news. The whole site is well worth a look. "Two Daddy Tigers and a Baby Tiger and Other Research Stories"
Janette noted that during her research with preschoolers no child ever suggested that you could not have two mummies or two daddies. "Using Picturebooks in Diverse Primary Classrooms"
Marilyn talked about her study of how two teachers used picture books in Year 4-6 classes. "Using Picturebooks as an Integral Part of a Mathematics Programme to Cater for Diverse Abilities and Interests"
So basically this talk was about using picture books to teach maths, and it was great. 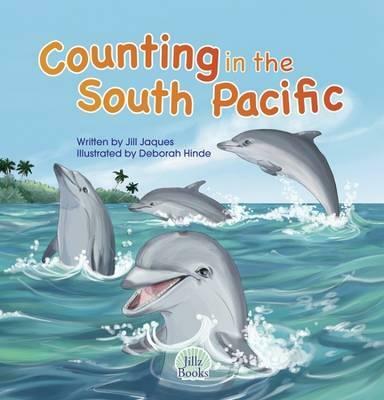 Brenda mentioned a few things that I will look for the next time I purchase a picture book about counting - has it got the number spelled out? Does it have pagination, and if so, is that distracting (as another number on the page)? Does it count forwards or backwards or both? She also mentioned that teachers can find contextual maths problems from the book they are reading at the moment e.g. "Counting on Frank". Brenda is another person I would love to hear more from, but actually that is everyone! Brenda mentioned lots of other picture books - "One Fish, Two Fish, Red Fish, Blue Fish" by Dr Seuss, "Ten, Nine, Eight" by Molly Bang, "One is a Snail, Ten is a Crab" by April Pulley Sayre, "Ten Black Dots" by Donald Crews, "How Much is a Million?" by David M Schwartz and "Measuring Penny" by Loreen Leedy. "Picturebooks in Initial Teacher Education"
Nicola talked about how teacher educators were using picture books to teach different learning areas from the New Zealand curriculum. For example, teaching science using "Koro's Medicine", maths using "The Nickle Nackle Tree" and social and cultural issues using "The Woven Flax Kete". Nicola noted that picture books were being used extensively across the curriculum in teacher education for multiple purposes. 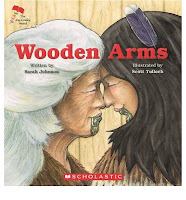 Nicola is also responsible for the New Zealand Picture Book Collection, an excellent website which links picture books that reflect "diversity in New Zealand society" with "specially designed, curriculum-linked classroom activities. Sarah described the editing process for her book "Wooden Arms". There were a number of changes made that related to Māori cultural practices depicted in the book. "Picturing Diversity: An Illustrators' Role"
Deborah gave a fascinating insight into the work that she does to ensure that she uses her awareness of cultural and physical diversity to accurately illustrate a text. The amount of research that she does was a real eye-opener. For example, she looks into things like what coconuts really look like, what kinds of crabs would be in Fiji and what types of wheelchair someone might use depending on their disabilities. 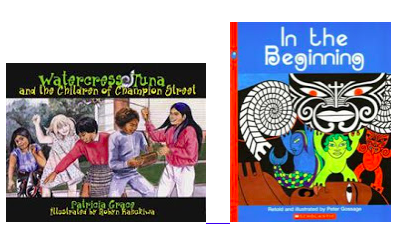 "Helping English Medium Schools and Preschools to Access More Diversity in Te Reo Māori Picturebooks"
Sharon talked about how she came to self-publish her "Te Reo Singalong" books. Nicola and her team hope to run this picture book seminar again next year, and if so I will be first in line to attend. I have so much to share back with the teachers from our school, loads of books to purchase and a lot to think about in relation to diversity. A day well spent. 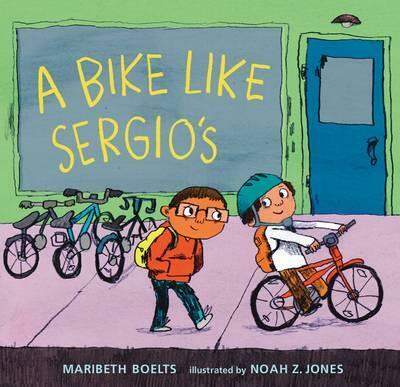 Ruben finds a lot of money that has fallen out of someone's purse, enough to buy him a bike like his friend Sergio's. He struggles with what the right thing is to do with the money, given that his family sometimes doesn't have enough money for everything on their grocery list. 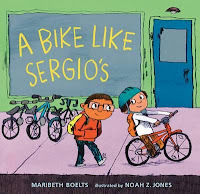 A nice story that acknowledges income equality and has a great ending (but it doesn't involve a bike).